No Hardware. No Software. No Malware. 52 percent of organisations report misuse of Internet resources, with the two most common being access to inappropriate websites (41percent) and excessive Web surfing (36 percent) (Department of Trade and Industry Information Security Breaches Survey). By the end of 2007, 75 percent of enterprises will be infected with undetected, financially motivated, targeted malware that evaded their traditional perimeter and host defences. Yet, these organisations will remain blissfully ignorant taking false comfort in antivirus and network scans that continue to show zero infections. (Gartner, 2007). Do Nothing � No longer a realistic option given the impact of a virus or spyware infection or the potential liability of users accessing inappropriate material on the Web. Add Software � The software option requires purchasing, installing, and configuring both software and the hardware it runs on as well as ongoing maintenance and upgrades. Add Appliance � The appliance option requires the same purchasing, installing, and configuring of both software and the hardware with arguably less maintenance and upgrades. 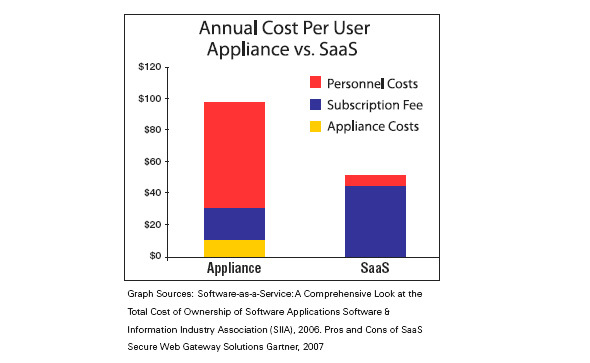 A better option is Web filtering in the form of SaaS. 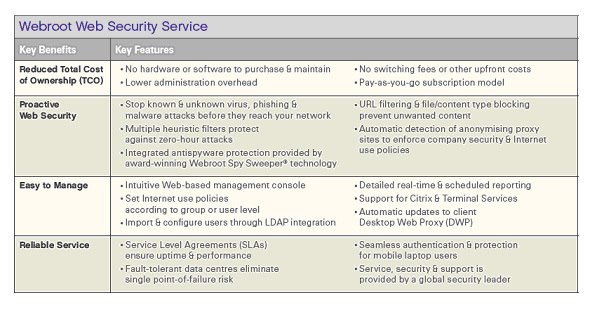 Webroot® Web Security SaaS is a hosted web security solution that offers a powerful alternative to on-premise hardware and software solutions at a much greater value. Internet traffic is routed through Webroot data centers where malicious Web threats and unwanted content is blocked before it reaches your network. This reduces bandwidth and eliminates the need to purchase, maintain and support costly hardware and software solutions, and lets you focus on managing and growing your business. Webroot Web filtering services are delivered at a fixed annual cost that allows for easy budgeting and ensures a predictable price without the need for hardware or software. This allows security expenditures to come out of your operating budget and not capital expenditure. Customers typically experience total cost of ownership reduction of up to 50 percent through reduced hardware and software purchasing costs, less staff resources maintaining hardware and application support and unplanned and planned downtime costs.